Your Alaska adventure probably includes the Northern Lights and a trip to Denali. These are must-see sights, but what about the lesser-known gems of Alaska? “The Last Frontier” is full of unique experiences and hidden surprises. Fortunately, our Princess Lodges are close to some of the best. Here are five spots worth adding to your list of places to visit. Located less than 10 miles from our Kenai Princess Wilderness Lodge, the Russian River Falls is classic Alaska. You’ll get up close and personal with nature. The falls are at the end of a two-mile trail. The trek is easy but it’s always a good idea to wear sturdy boots. 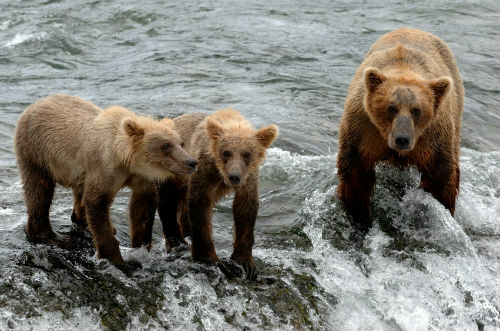 Watch as salmon wiggle their way upstream in search of spawning grounds – but be mindful of the bears. Brown and black bears frequent the area in search of food. Don’t worry, they stay far enough away and won’t bother you if you don’t bother them. Okay, so the wilderness is not where you expect to find amazing Thai food, but Alaska is full of pleasant surprises. The Thai and Chinese Food to Go is housed in a non-descript blue trailer a few miles from our Denali Princess Wilderness Lodge. Two people can eat like kings for less than $20. Make sure to bring cash because the restaurant doesn’t take cards. The restaurant is to-go only, so grab your food and hit the road or make a picnic. See spectacular Alaska landscapes while feasting on some of the best food around. Billed as “Alaska’s only Historic Theme Park,” Pioneer Park is part history lesson and part family fun center. Take a ride on a carousel, play a round of miniature golf or learn a little about Alaska in one of the park’s many museums. Admission is free, with small fees charged for some of the attractions. This is a great place to take the kids and because it’s only three miles from our Fairbanks Princess Riverside Lodge you can be back in your room for naps in no time. All aboard! There’s truly nothing like the Hurricane Turn. The train is one of the last flag stop trains in the world. Locals use the locomotive as a way to get to and from home. You can get off anywhere along the 115-mile route and see parts of this great state that few get to see. When you want back on, simply wave a flag as the train passes or stay aboard and enjoy the scenery. Bring food aboard and make a day of it. The train departs from Talkeetna, which is about an hour away from our Mt. McKinley Princess Wilderness Lodge. This half-mile trail leads you into one of the most incredible forests on Earth. The trees and plants that grow here do so despite short growing seasons, snow and temperatures that reach 40 to 50 degrees below zero. The trail also offers a glimpse of Mt. Wrangell, Alaska’s largest active volcano. On a clear day you can expect to see a plume of steam rising from Wrangell’s dome. The trail is less than a ten-minute drive from our Copper River Princess Wilderness Lodge. With any vacation there’s always more to see than time to see it. These five places are a great addition to any itinerary. They’re fun, interesting and perhaps best of all – they’re close.